Tech at Night: Barack Obama ORDERS China to stop attacking us, and his FCC fudges spectrum figures. Tech at Night: Google Reader popularity again proves nobody cares about privacy. 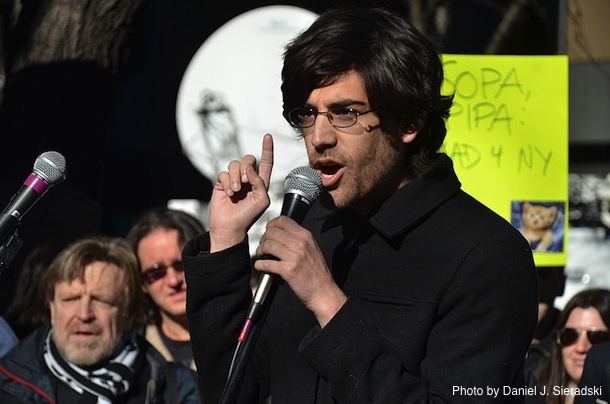 Catch my latest on Aaron Swartz. Aaron Swartz committed a modern crime: he unlawfully used the MIT computer network, automated the download of many, many copyrighted works from JSTOR, and then infringed on the copyrights of those works by engaging in mass redistribution. Swartz then, to the great sadness of those who knew him, killed himself rather than face possibly decades in federal prison. That act has infused the entire situation with great emotion, driving left-libertarians out to campaign against copyright. It’s also encouraged some on the right to make the best argument there was against the Swartz prosecution: that it was a case of an overzealous government official seeking to destroy a person, as an example or a feather in a cap. It turns out that wasn’t the case at all, though. It turns out Aaron Swartz was the only one looking to make an example out of Aaron Swartz. Yes, the linked Huffington Post article is now the latest pro-Swartz spin: that he was actually innocent, even when defenders admit he was guilty, that he was caught on camera, that he was actively evading IP and MAC bans, and so he clearly not only did it, but he knew what he was doing was opposed by JSTOR. Heymann initially charged Swartz with several felonies that could have led to many years in prison, and offered a plea bargain whereby Swartz would spend less than a year in prison. Believing he had a better chance to beat the charges, Swartz rejected the offer. Aaron Swartz was not made an example of mass copyright infringement by anyone but himself. He, possibly misled by callous ideologues like Larry Lessig, clearly thought that he could be the great test case. When you did it, you know you did it, you were caught on camera, logged in the act, and everyone knows it, then the only reason you think you’re going to beat the case is going to be jury nullification. Swartz wanted to be a martyr and, to the great sadness of friends and family, could not go on when the price of martyrdom became too great. It’s understandable that people dealing with such a loss will feel strongly, and want to cast blame around. But it’s not right, and it’s not fair, to try to blame the prosecutor for the poor choices Aaron Swartz made in his life, and especially at the end of it. However, it discredits a political movement to try to use Aaron Swartz’s body to try to promote their agenda, which they could not further through logic and reason. Let the family and friends move on. Argue your policies on their own merits. Let Swartz rest.